The first How-To book I ever recieved. It was a birthday gift from a dear friend. I highly recommend this book for the novice DIYer as well as the expert! T-Shirts are one of my favorite fabrics to use; they're cheap (sometimes free), they can have awesome patterns, colors, and phrases, they're easy to work with, and they are super soft and comfortable. 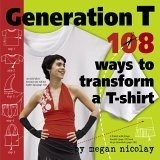 This book teaches you how to redesign a t-shirt into everything from another shirt, a rug, and even a wedding dress. The techniques range from difficuly - some even require no sewing. All of the projects can be sewn by hand. (I was using this book before I even learned how to use a sewing machine). Through these projects you start to develop your sewing techniques. I am forever greatful for this book as it made me the crafter I am today. I received this book as a christmas gift from my brother this past year. There are a lot of different reasons I love this book and would suggest it to anyone! For one, there are a magnitude of different projects at different skill levels, and with each project the authors list a variety of "variations" to make the garment uniquely your own. I also love this book because all of the projects have to do with transforming one article of clothing into another. It allows you to re-juvinate your wardrobe opposed to simply buying a new one (a great way to save money). In many ways this book is similiar to Generation T, but one of the things that seperates it is that it has a variety of projects for different types of clothing. Some projects require T-shirts, others: Jeans. Some need sweaters and there is an adorable blazer/jacket made from a sweatshirt. My favorite project that I have done from this book so far is the Denim Ballroom Skirt. I believe this book is a great second step from Generation T because it follows many of the same sewing skills, but challenges you with different fabrics! Definitely a great gift for the avid crafter! I purchased this book a few months ago at Barnes and Noble. I was drawn to its use of basic clothing - sweatshirts, t-shirts, men's button ups, and ties - to create interesting and intricate-looking items of clothing. What I really love about it is, although the finished pieces look complex, the process to make them is super simple! The final result of every project is a one-of-a-kind couture masterpiece. The techniques are easy and the results are beautiful! It's another great book for beginers, but can also challenge the way a more experienced sewer/crafter looks at clothing. I also really love this book because, like Generation T and Alter Nation, it puts the focus on repurposing and upcycling rather then creating something from scratch. This book shows unique ways to transform clothing you already have. Updating my wardrobe without spending money is one of my favorite things to do!